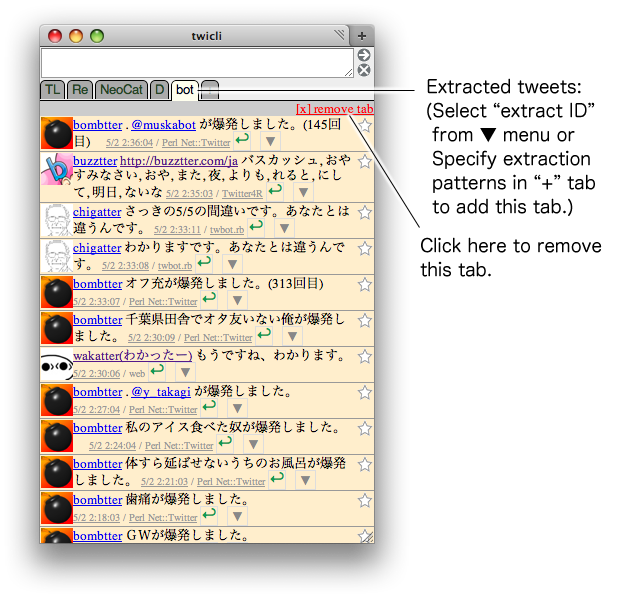 twicli is a browser-based Twitter client. No need for installation. All you need is a Web browser. Automatically fetches timeline, and show with cool animation. 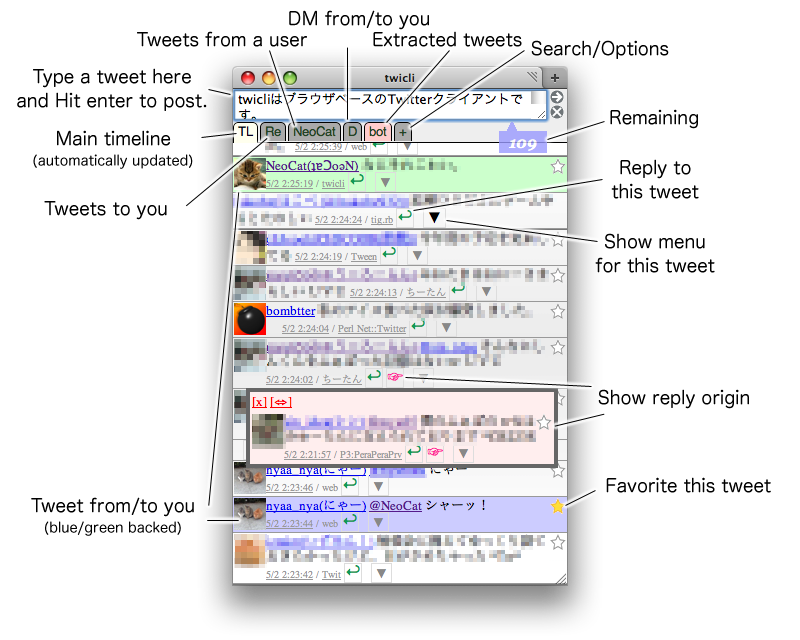 Useful when you are in an Internet cafe, doing something else while viewing Twitter timeline. 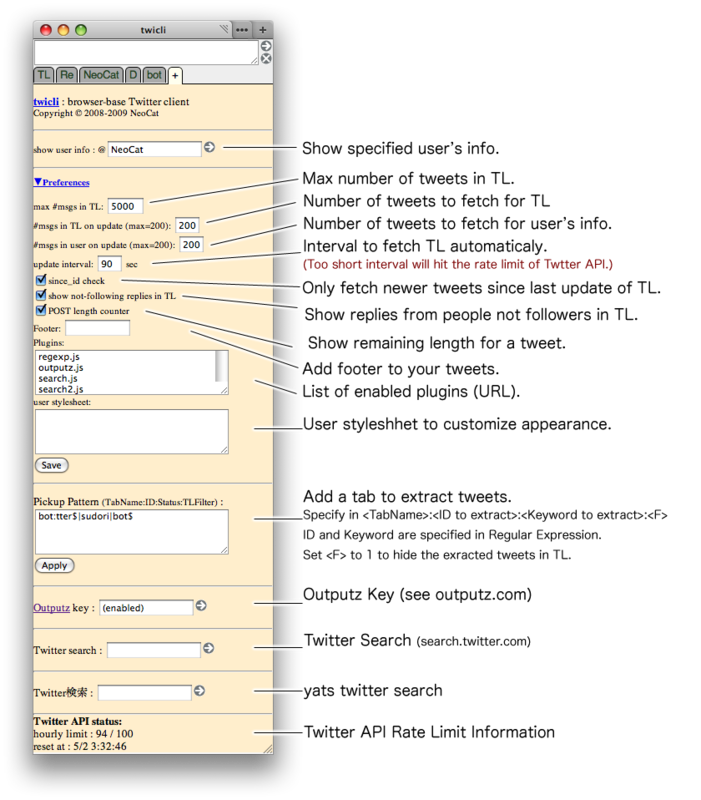 Works on IE7 too, but some parts aren't displayed properly. Just click the link above, or run it as a bookmarklet. When you get asked for authorization, please follow the instruction on each page. => Please see this instruction page. => Please intall JSONView add-on to avoid JSON download dialog. => Please write "d username message contents" in the tweet field and send it. You can write "d username" more easily by clicking reply button in D tab. You must be followed by the destination user to send direct messages. How to hide tweet which contains specified kerwords? => Write "-::keyword:1" into "Pickup Pattern" in the "+" tab. => Twitter may be too crowded. Try writing just "r" and hit enter to re-post your previous tweet. => Default appearance isn't decorated at all to display many tweets at once. You can customize twicli's appearance using CSS. Please refer "Customize" section below. You can find more information in twicli wiki. There are also some information about customizing twicli in twicli wiki. There are some guys publishing more stylesheets for twicli (=>twicli wiki). You can register plugins by setting them at the "Preferences" in the "+" tab. sound.js: Play sound when 'TL'/'Re' is updated. stream_search.js: Update keyword/hashtag search results on real-time using streaming API. find_rt.js: Find out which tweet is targetted by '>RT'. lists.js : Add a tab that shows lists you following. Specify the name of lists to make tab in "+" tab. 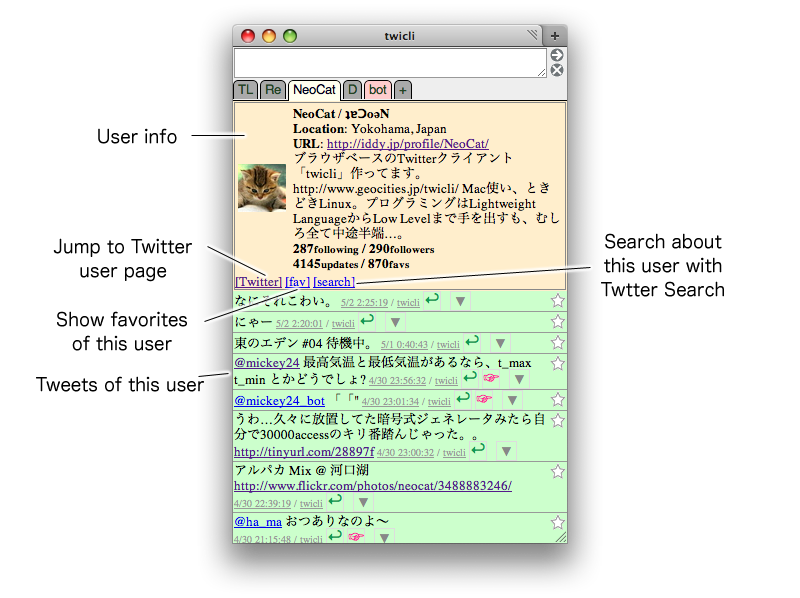 search.js : Add keyword search by Twitter Search to the "+" tab. followers.js : Colorize tweets of users that you don't follow in blue. To use this, you need to fetch the list of followers by clicking the "Renew" button at the "Color followers" section. thumbnail.js : Add thumbnails to the URL of some photo sharing services. 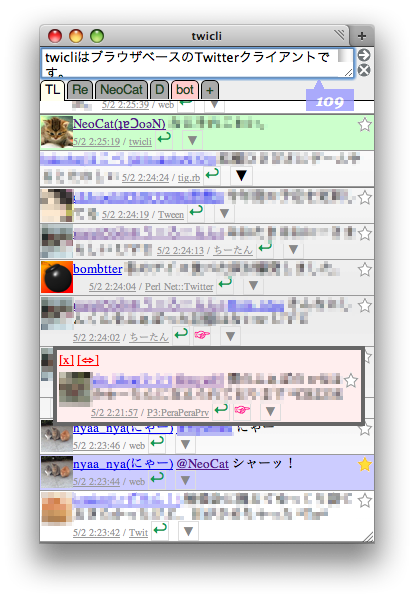 Currently supports twitpic, movapic, HatenaFotolife, Tumblr, yFrog, Plixi, img.ly, Ow.ly, Flickr, Instagram, picplz, Mobypicture, via.me, YouTube, Nico Nico Douga, and SlideShare. geomap.js : Display inline Google Map by clicking the marker ( ) of tweets with GeoLocation. mute.js: Add a menu to mute (hide) tweets with specified user or hashtag temporarily (1 hour) in ▼. multi_account.js: Switch between multiple accounts in '+' tab. Useful with tabbed browsers. notify.js: Display notification from @twicli on startup. tweets_after_rt.js: Find tweets done after retweets of the specified tweet. "twicli" is developed at github under MIT license. Please report any bugs/wishes to @NeoCat. Your patches are also appreciated.